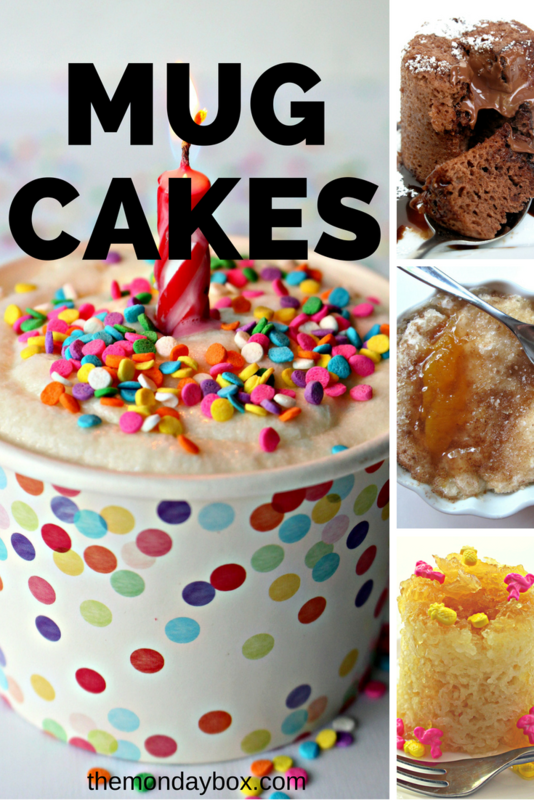 Mug Cakes are the fast, easy answer to cake cravings! Individual cakes are cooked in a mug in the microwave and are ready to enjoy in just one minute! 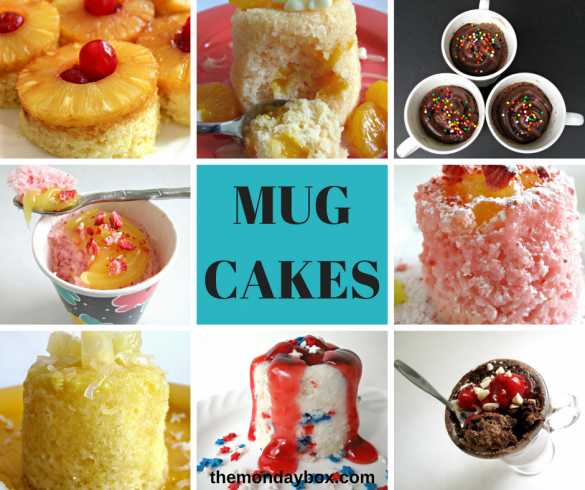 Cake mix mug cake can be prepared in dozens of mouthwatering flavors at a moment’s notice. Mug Cake recipes on The Monday Box are all made using only a handful of shelf stable ingredients. Enjoy these tasty cakes at home or send the ingredients in a care package to hungry college students for dorm room snacking or in a military care package to sweeten the day for our troops! Add-ins are essential for a moist texture that mimics oven baked cakes. Eliminate the spongy texture often found in microwave baking by adding extra moisture to your mug cake (and delicious flavor) with syrups, sauces or condensed milk. The syrups stirred in before cooking add to both the flavor and the texture. Don’t skip them. The syrups added after cooking are for flavor and eye appeal and are optional. Watch your first mug cake carefully for doneness. Each microwave is different and your mug cake may take a bit more or less time than indicated on the recipe. If you want to transfer your cake out of the mug and onto a plate, coat the mug with cooking spray before adding the cake ingredients. If you want to eat your mug cake right out of the mug or if you are using a microwave safe paper cup, no spray is needed. Mug cakes cook instantly and are meant to be eaten instantly. They are not meant to be stored and eaten later. When sending mug cake ingredients in college and military care packages, I highly recommend adding paper cups or paper snack cups. These care package recipients don’t have time for dish washing and aerosol cans aren’t allowed in military care packages to deployed service members. Prepare the “magic mix” of flavored cake mix combined with angel food cake mix before mailing. Store the mixture in a freezer weight ziplock bag, and use a permanent marker to write the directions for how to make mug cake with cake mix on the bag. Send ingredients with resealable packaging whenever possible. If a can must be sent, include a can opener in the care package. Avoid ingredients with glass packaging whenever possible. If a jar or bottle must be sent, enclose the item in a ziplock bag and wrap in bubble wrap. Don’t wait another minute! You could be indulging in your very own luscious mug cake right now!